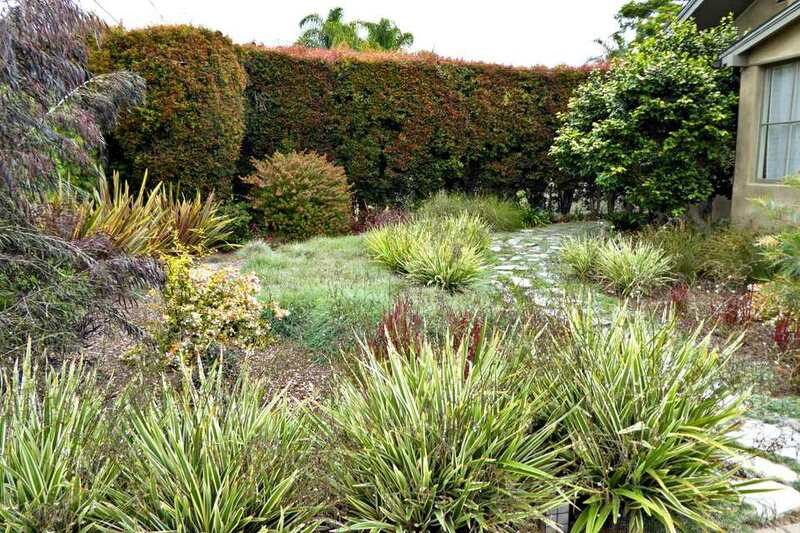 The Goal: To replace a dying lawn—basically an empty space—in the front yard of a Santa Barbara area house with drought-tolerant plants to reduce watering and cut down on maintenance while still looking good. Where: Carpenteria, California, a small beachside community near Santa Barbara, California. Who: Jill and Jennifer Allen and their two dogs. Continue to 2 of 28 below. Homeowners Jill and Jennifer Allen live in the small, beautiful coastal town of Carpenteria, which is just south of Santa Barbara, a crown jewel and coveted vacation destination in Southern California. After living in Tokyo and Chicago, the Allens rented the beach area home for a couple of years before convincing the owners to let them buy it. "The house was a definite 'fixer' as was the landscaping," explains Jill. First on the agenda was repairing and remodeling the plain, cottage-style house: basically working from the inside out. After years of tackling indoor renovations, the time finally arrived to address what was going on outdoors. "We had a messy pittosporum tree in the front and a 70-foot-tall Italian stone pine in the back that split and fell over during a storm some 10 years ago," says JIll. "The rest was grass lawn. The landscaping has gone through many transformations, some good and some not so good. After renovating the house, we eventually realized we needed a professional to help us create a landscape to properly enhance our 'new' home and not require lots of watering." Continue to 3 of 28 below. That's when they enlisted the services of Billy Goodnick, a Santa Barbara area award-winning landscape architect, design coach, author, and speaker. 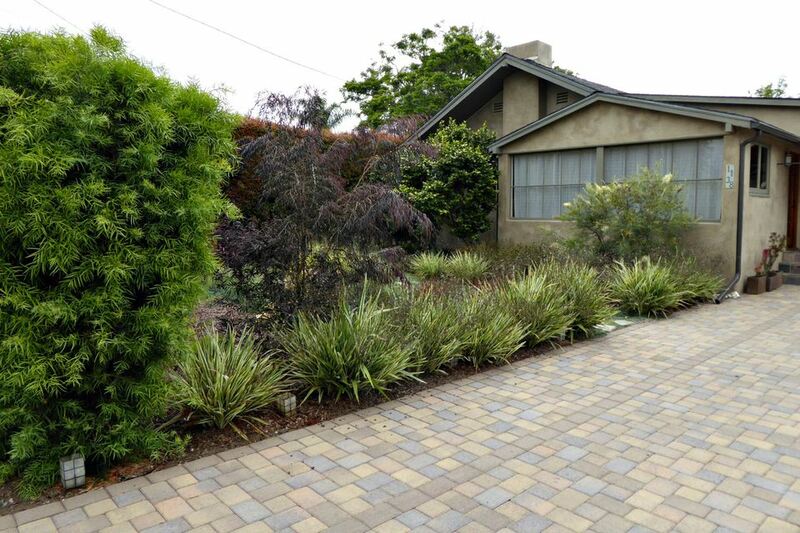 Goodnick is a longtime proponent of water-wise landscaping, which the city of Santa Barbara has been practicing in varying stages for years, ahead of the movement compared to other drought-stricken regions. "It was a lawn that had gone bad," says Goodnick, "And they were tired of that. Jill pitched around ideas—she's very artistic—and she had a good sense of what she wanted. We both wanted to reduce water and have it look nice from several different angles." Continue to 4 of 28 below. Goodnick's plan view shows the existing house, street, driveway, and his ideas for softscape and hardscape layout and elements in the Allens' front yard. Hardscape? "If it isn't green, it's hardscape," Goodnick explains. The designer felt the garden needed to be approached from two completely different views. "I believe this is the landscape's essence: the first impact or view is when you walk up the driveway and the other is when you're inside the house looking out—there needs to be some eye candy," he says. Continue to 5 of 28 below. Goodnick describes the process between clients and himself: "The preliminary drawing shows that there's going to be a screening plant here, a colorful one over there, something tall here, or a tree over there. I send my client the list of possible plants--ones I think are good matches." Yes! Can we please have it? "I call it 'stocking the pantry'", Goodnick explains. "From their top choices, I refine the list and come up with something I think is going to work." Continue to 6 of 28 below. "Another key design element was a sense of separation between the driveway and where the garden starts, which would typically be like a little boxwood hedge or picket fence," says Goodnick. "Instead, we went softer, using that variegated grassy-looking stuff (Dianella; next to the driveway). Continue to 7 of 28 below. A once-bare front yard had no curb appeal or interest for the homeowners or guests when it was viewed from either the driveway or indoors. Located on a quiet street without curbs or sidewalks, there was also little privacy or separation from the road. A screening hedge of Podocarpus now shields the view from the street and a diverse planting of Mediterranean climate plants from New Zealand, Australia, South Africa and other areas have reduced water use and maintenance while providing year-round beauty. Continue to 8 of 28 below. The Allens made improvements to the home's exterior before deciding to landscape by painting the house and trim, adding attractive wood fences, and an interlocking paver driveway. Continue to 9 of 28 below. A rich wood fence and gate with planks placed horizontally offers a modern alternative to the traditional vertical and is a trend that is growing in popularity. It's a quick and easy way to update and upgrade a home's exterior. Continue to 10 of 28 below. The entrance to the driveway offers a view of the property's privacy, which was created with living walls instead of iron gates for a more natural look. On the right: the darker Eugenia hedges; on the left are lighter Podocarpus. Continue to 11 of 28 below. As evidenced, Dianella's neat clumping habit makes it perfect for mass plantings near borders, beds, and pools and provides year-round color in zones 8-10. Once it's established, it needs to be watered only occasionally. Continue to 12 of 28 below. The flagstone path is flanked on either side by the Dianella, then deep red Japanese blood grass (Imperata cylindrica 'Rubra'). Continue to 13 of 28 below. Meandering along the path, to the far left is the Japanese blood grass, blue sedge, and more Dianella. The homeowners requested a lawnlike area for their two small dogs, and Goodnick's solution was the blue sedge, which he says uses about half the water as "regular" lawn grasses but has a low-growing habit and does not have to be mowed. Continue to 14 of 28 below. Continuing down the path in the front yard, low-growing blue sedge is accented by clumping, strappy Dianella, Mexican heather (Cuphea hyssopifolia), and pink grevillea added to the mix at the right. Beyond, is the fountainlike Muhly grass. Continue to 15 of 28 below. A view from the ground, looking streetward at the ornamental grasses and privacy hedges. Basically, this is the view the Allens' small dogs have. The grasses on the right, against the hedge, are New Zealand flax. Continue to 16 of 28 below. The Allens' front lawn has become a tame meadow of ornamental grasses, featuring blue sedge, New Zealand flaxes, Japanese blood grass, and muhly grass. Continue to 17 of 28 below. Beautiful, fountainlike pink muhly grass with its wispy pink flowers (blooms) is an eye-catching addition. "At the end of that path, the grass sort of 'explodes'--it's intended as a focal point," says Goodnick. Continue to 18 of 28 below. Muhly grass is a show-stopper and blooms during the spring and fall. In larger landscapes, it looks especially striking in mass clumps or along borders. Continue to 19 of 28 below. With a "lawn" of blue sedge, various drought tolerant ornamental grasses surround it, showing the differences in height, form, and texture. Continue to 20 of 28 below. The flagstones become more broken up and casual as the path winds along the side toward the back yard (which is in the works). Continue to 21 of 28 below. A lush carpet of low-growing blue sedge contrasts with a purple fountain grass. Continue to 22 of 28 below. Grevilleas are exotic flowers that look like tropical proteas—in fact, they are members of the protea family. These Australian natives are drought tolerant and blooms make gorgeous cut flowers, especially in arrangements. Continue to 23 of 28 below. A strappy, yellow variegated New Zealand flax grows behind a detailed cuphea. Continue to 24 of 28 below. Natives to Australia, grevilleas thrive in the moderate climate and even clay soil of Southern California. This shrub's flowers range from creamy white to yellow to pink to dark rose and are delicate and cone or corn-cob shaped. This outstanding large shrub can be pruned into a small tree that flowers nearly all year in frost-free areas. Hundreds of seven-inch-long clusters of creamy white flowers cover the plant and can be used as cut flowers, if cut at the right time. It tolerates partial shade as well as full sun in hot dry areas or on the coast, and does not seem to be particular about soil type, as long as it is well drained. Birds, bees, and butterflies love it. Other similar cultivars are ‘Sylvia’ (crimson flowers) and ‘Honey Gem’ (rich orange flowers). Continue to 25 of 28 below. An older, existing camellia shrub pruned into a tree form was one of the plants that the Allens wanted to keep. A hardy shrub, Camellia japonica produces beautiful flowers during the winter months in Southern California and other regions. Continue to 26 of 28 below. The various grasses and shrubs in the Allens' yard aren't fussy, but still need to be pruned and maintained at least a few times a year, mostly in the fall and spring. This helps everything retain its separate shape instead of growing into a huge, dry, unwieldy jungle. Continue to 27 of 28 below. Continue to 28 of 28 below. Another view as you enter the property shows the path winding around the side of the house. Besides being a practical touch, this visually elongates the yard with the suggestion of something around the corner. Which Plants Have Multicolored Foliage? What Are the Best Flowering Shrubs To Plant in a Yard?